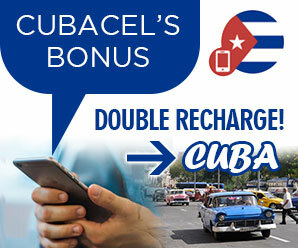 cubacayoromano.com | Want to know before you go? 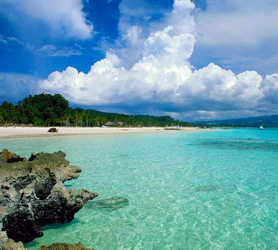 Official Cuba Cayo Romano information and guide, get facts and latest news. It’s nothing personal we think, but fish don’t like people much. On Cayo Coco and Cayo Guillermo you’ll be able to see a few fish darting around and, if you swim out (away from the people) you´ll see more, but never large quantities. But this is not so on Cayo Romano, you see Cayo Romano has no hotels, buildings or people. The Cayo Romano Island, just 20 minutes from where you are staying, is entirely uninhabited. Just expanses of the same beaches you have visited near your resort, yet with nobody on them. Yes, if you enjoy Snorkeling, don’t waste a second to visit Cayo Romano. How to get to Cayo Romano? The first left turn takes you to the virgin and uninhabited northern coastal beaches, then on to Cayo Paredon Grande on the same road. From any of these heavenly coves you’ll find that within a few meters of the beach the sea is literally teeming with fish, coral and marine life. There’s an even better spot though, don’t take the first left but the second (about 2km later) and you´ll arrive at a beach and coastline with numerous palm lined coves. The beach here is around 4km in length and, once again, totally deserted. Finally, if you don’t turn left at the second turn off, instead continuing ahead, you’ll reach the end of Cayo Romano. Here you’ll find several lagoons where fish come to breed and smaller species spend their first months before venturing out to sea. 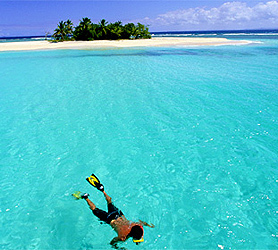 Why snorkel on Cayo Romano? You’re invariably going to see a total transition of fish behavior. The fish are both closer to the shore and more numerous, totally unfazed by your presence. The untouched beaches are littered with starfish, with crabs jetting back and forth from the sea. Around the month of December, Sea Turtles lay eggs on the beaches here which is quite a spectacle. The coral reefs are packed with fish nursing their offspring and rocky coves are simply teeming with all sorts of marine life. At the last spot we mentioned, you´ll also be able to explore some densely populated marine lagoons which stretch between the reefs and the shoreline. There is one “Blue Hole” in this area which is perfect for seeing larger species. There are no poisonous fish in Cuba, no sharks or predators anywhere near the coast and, few, if any, sea urchins (unless you swim in rocky cove areas) to stand on! Forget snorkeling where you’re staying and try this! Virgin untouched beauty. Should you book a fishing trip to Cayo Romano or go it alone? Many anglers ask themselves this question, often venturing into the unknown has them scurrying to a $5000-$7000 package deal. However, no permits are required to fish in Cuba and, the beauty of fishing the flats is that no boat is required anyway. The weather is so good you can fish in shorts and a t-shirt. In certain areas you can wade out for over 1km and still find compacted sand on the flats in these shallow waters. What a tour will certainly get you is fishing from a boat, maybe a few blue holes but, is this really necessary? You will need to rent a car to move you and your fishing gear around plus, get out to the best remote areas of Cayo Romano or Cayo Paredon Grande (just further up the road). You can book a Car Rental in Cuba with us at the link. You will need accommodation. 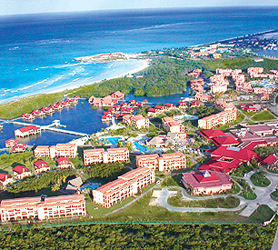 The easy route is to take an all-inclusive Hotel on Cayo Coco. Cayo Coco is just 15 minutes by car from Cayo Romano and, getting here is as easy as driving back past the airport, then continuing along the only road there is. If your budget does not extend to an all-inclusive, or you’d prefer to stay in the “Authentic Cuba” then this is not a problem. You can stay in Moron at either a cheap $20 per night hotel or a cheaper Casa Particular (around $15) by checking here. If you are serious about a fishing trip to Cuba, whether it be to Cayo Romano or anywhere else on the island, click the chat button on this website and tell us what you’d like to do, when you’d like to go and how much you’d like to spend and we will create a package to suite your exact budget and needs. There’s no cost to chat with us about this, so give us a try, we’ve been booking trips to Cuba since 1995, so you’re in good hands! It’s a dream of many anglers to catch a bonefish, tarpon and permit during one day of fishing. Achieving your own Grand Slam is a reality in the waters off Cayo Romano. It is no secret that Cuba’s northern coast is well known to ensure some of the best fly fishing possibilities in the Caribbean. Cayo Romano holds big numbers of local tarpon and, on some of them are big schools of migrating tarpon, passing by on the way to their spawning grounds. Cayo Romano and the area in the bay between the island and Cayo Paredon is perhaps the most interesting destination for giant tarpon in the Caribbean. Both Cayo Paredon and Cayo Romano are still relatively unknown to anglers so, finding a good spot is as easy as patrolling the desolate flats. You simply won’t see more than 1 or 2 other anglers, if any at all. The beauty of fishing off the coast of Cayo Romano is that the big three – tarpon, permit and bonefish – can be caught the whole year round, making it possible to catch your own “Grand Slam” with relative ease, especially if you start out early and make it a whole day of fishing. While searching for your trophy, you’ll get barracudas, groupers, jacks, trigger fish. You’ll also snag the ferocious Cubera Snapper, one of the hardest fighters compared to its size and weight. The different species that are to be found on the flats make the fishing very rewarding since there are always some fish around that can be caught. Just come prepared and in good shape because while trying for your Grand Slam they might be some very strong fighters! The huge flats offer great Grand Slam possibilities for the flat angler. You can fish for bones, permit and tarpon by wadeing the shallow flats and bordering mangroves and, if you wade out far enough, you can go ahead and cast into a blue hole for big tarpon. However some real giants can be caught just by staying on the flats. If you stay on Cayo Coco and hire a car you can explore Cayo Romano with your family. It’s a great destination to let the kids play around on the beach while you get off to snag a big one! It’s very easy to remain in eyesight but still get some serious fishing under your belt. Both Cayo Romano and Cayo Paredon Grande offer easily accessible flats that are an inviting combination of hard packed white sand and a semi firm mottled bottom that guarantees a solid footing and good wading. What you will find is a virtually untouched flats oasis, absolutely teaming with fish and wildlife. Both locations are excellent for those who like to wade close to the shore. The amount of area that’s wadeable is simply stunning and, as you’ve guessed; the need for an expensive tour or even a boat is simply not essential in order to enjoy this virgin area. You can go it alone with your rod or, with a few friends, and have an immense fishing experience. In these shallow waters, bonefish are a healthy 2.2kg (4lbs) and during the course of the day it is not unheard of for guests to land a fish or two in the 4.5kg (10 lbs) range. Tailing bonefish are widespread and you can expect to frequently see bonefish in singles and doubles, all the way up to schools of several hundred fish at a time. What really sets this location apart from so many others in Cuba is that anglers can expect to encounter and get shots at good numbers of permit fish each day. There are very few places on earth where guests can fish for big bonefish each day and get shots at tailing permit at the same time. The consistency of this is virtually guaranteed at Cayo Romano no matter when you go. In fact, it is a rare day when you don’t encounter and get shots at permit. When you do snag a permit, it will range in size between about 3.6 and right up to 13.6kh (8 – 30lbs). During the months of April and May, during breeding seasons, the sardine schools are in and fish over 45kg (100 lbs) can be landed. The best time to fish at Cayo Romano would be from early April to late June. This is both based upon local weather together with the massive influx of migratory Tarpon that can easily weigh up to 45kg (100lbs). The entire months of July and August offer equally good fishing, but the temperatures can make for a hot angling expedition. If however you are accustomed to the heat then it’s perfectly fine and the fishing in Cayo Romano is great during these key summer months. The months of September to December turn out to be excellent Bonefish month and for reduced quantities of large and medium Tarpon. From the early part of the season from say January to March there’s still good fishing to be had, primarily Permit and Bonefish as well as varying weights of Tarpon of up to 13kg (30lbs). Cayo Romano is well protected by a string of cays that shelter the majority of the fishing spots from the elements however in these months from Jan-March winds can sometimes be problematic but for many increase the complexity, making the angling more rewarding. 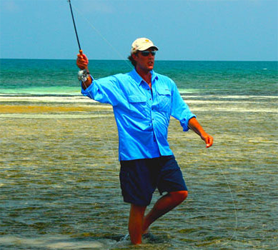 Cayo Romano is ideal for saltwater fly-fishing with various species like; Tarpon, Permit and Bonefish. Expansive hard bottomed open water flats adjoining deep blue channels make for visually stunning fishing, also providing outstanding wade-fishing opportunities. Innumerable lagoons, islands and bays offer a diverse and interesting environment to explore, you’ll be astounded by the sheer numbers and size of fish just meters off Cayo Romano’s idyllic coast! Anglers in this area have caught a Tarpon on a fly-rod weighing a staggering 72kg (160lbs). Similar fish can be hooked on a regular basis in the area; you need only throw the line and relax in the crystal blue water for a bite. 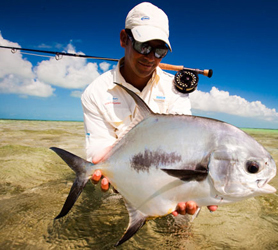 You’ll be amazed by the numbers of large Permit fish in the 4.5-13kg (10-30lb) range that skirt the firm bottomed white sand flats of Cayo Romano. 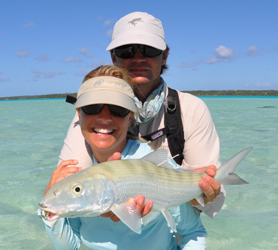 Probably the most rewarding angling experience at Cayo Romano is the Bonefish. Catching Bones on a light fly-rod is an ideal combination of challenge, skill and excitement. The average size of Bonefish in the area is around 1.8kg (4lbs) with perfect opportunities with both individual and groups of tailing Bonefish plus, shoals of up to several hundred are frequently seen. Land one or two fish in the 10lb range will surely make your day! What should I take to fish in Cayo Romano? You’d be better to take a spinning rod and fly rod arrangement and, possibly some wire trace and a large fly or a spinning rod with a barracuda lure will ensure some explosive fishing action and overall rewards. Fly-Fishing is called Pesca con Mosca in Cuba. 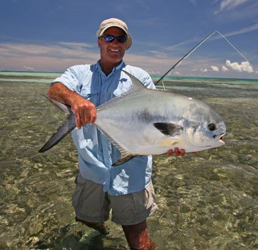 Do I need a permit to fish at Cayo Romano? Are you a fishing enthusiast looking for the latest and greatest fishing experience? Cayo Romano is one of the most exciting new saltwater fishing locations available in Cuba and possibly the Caribbean. Just minutes from Cayo Coco, if you are staying on this adjoining island you can be in the sea in Cayo Romano and fishing within 30 minutes! Located on the North Coast of Cuba in the Jardines de Rey archipelago, it consists of a huge fishable area that includes Cayo Paredon, a small islet connected by road to the north coast of Cayo Romano. This area consists of an enormous marine system of superb hard bottomed flats, lagoons, channels, blue holes and pristine estuaries. Totally virgin, you will not find other fly-fishermen in the area because it has been protected from commercial fishing for decades. Furthermore, the Cuban authorities have strictly enforced these commercial fishing restrictions and it is this that has given rise to the incredible fishing that is available today. There is no permit required, so just bring your equipment and start fishing! 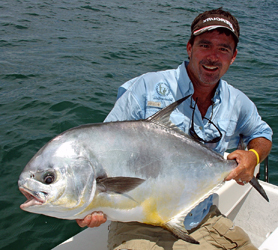 Incredible fishing opportunities are here for the taking with big Permit Fish, together with some really exciting Tarpon fishing on the pristine flats. This whole area has remained virtually untouched by sport anglers for over 3 decades and could be described as some of the best fishing available in the Caribbean today. 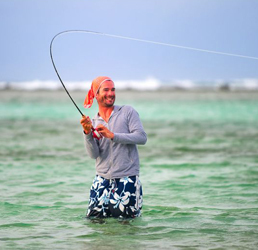 Book your accommodation in Cayo Coco Hotels to take advantage of this amazing fishing experience. The island of Cayo Romano has an area of 777 km², the largest in the Jardines del Rey Archipelago, its neighbor and fourth largest Cayo Coco, has an area of 370 km2. They are part of a group of islands, keys and islets on Cuba’s north central coast called Jardines del Rey or the King’s Gardens. Unlike its two neighbors of Cayo Coco and Guillermo, Cayo Romano has yet to be developed but does offer some pristine virgin beaches and astounding scenery. About 19km from Cuba’s northern mainland, in the Atlantic Ocean, the whole archipelago where Cayo Romano is located includes over 2,500 islands and islets spanning several provinces which include primarily Ciego de Avila and Camaguey. The islands of the Jardines del Rey first saw tourist development in the 1990s, first was Cayo Guillermo in 1992, with the opening of the Hotel Gran Caribe Club Villa Cojimar, followed by a resort called Guitart Cayo Coco (now the Hotel Colonial) opened in 1993 on the neighboring island Cayo Coco. Cayo Romano, despite having a road running directly to it from Cayo Coco, is yet to be developed. In the 1990’s, there wasn’t an international airport on any of the islands. Tourists would fly into the Maximo Gomez airport located in the capital of Ciego de Avila. The construction of the pedraplen causeway from the mainland began in 1988, its 27kms (16 miles) length connecting Cayo Coco to the mainland of Cuba was concluded in just 3 years and, with it began the unprecedented era of tourism on both islands in the King’s Gardens. There’s a seven kilometers causeway connecting Cayo Guillermo with Cayo Cayo Coco, which ends with a 1.5 km bridge that connects Cayo Romano to Cayo Coco. The bridge is still not prepared for very heavy traffic and needs reinforcing before development on Cayo Romano can really begin, however, its perfectly fine for cars. Cayo Romano is 516km (320 miles) from Havana. Varadero is 472 km (293 miles) from Cayo Romano, whereas the closest cities to Cayo Romano are Ciego De Avila (population of 86,100) at 101km (62 miles) and Moron (population of 60,600) 62 km (38 miles). Cayo Romano and Cayo Coco are just 1.5km apart and are connected by the aforementioned causeway and bridge. Cayo Guillermo is around 32 km from Cayo Romano. Even though there are no direct flights, to give an idea of just how close Jardines del Rey in Cuba is to The Bahamas, the Clarence A. Bain Airport (MAY) in the Bahamas is just 214 km (132 miles) from Jardines del Rey International CCC Airport near Cayo Romano, Cuba. With regard to the United States of America, Key West Florida is just 272 miles (438 kilometers) by flight from Cayo Romano, Jardines del Rey. Posted in Where is Cayo Romano Cuba? | Tags Cayo Coco to Cayo Romano, Cayo Guillermo to Cayo Romano, Day trip Cayo Romano, Getting to Cayo Guillermo, Where is Cayo Romano Located?